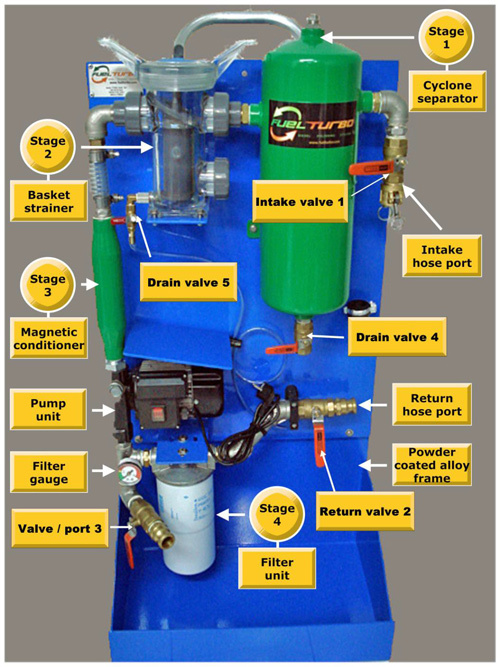 FuelTurbo Mobile Diesel Fuel Polishing, Purification Systems, Test Kits. Complete turnkey solutions for diesel cleaning, diesel polishing, diesel tank cleaning and algae contamination removal with a mobile portable system. The system can be used in your existing in-house workshop or added as a service item to increase sales revenue and we recommend the use of the system with these field service diesel fuel test kits. The FuelTurbo unit is a high performance mobile fuel polishing and diesel cleaning system for diesel fuel and fuel tank systems. It allows you to safely recover, recycle and reuse diesel fuel that might otherwise be discarded or become a major problem for diesel engine reliability. Although a high tech system it can be operated by anyone with basic mechanical skills. No fuel pipes, supply or return lines need to disturbed from the engine / equipment that is being serviced. No particular knowledge of the engine or equipments fuel system therefore needs to be known by the technician. The FuelTurbo is as a professional, cost effective, environmentally sound solution for diesel fuel and tank contamination problems. The FuelTurbo polishing system can be used to clean diesel tank systems in the below applications and many more not listed. The diesel fuel cleaning system draws the fuel out of the tank, through four separate stages of fuel purification and water / sediment / bacteria removal and then returns the clean diesel fuel back to the tank. Our low maintenance machine has a number of key elements including a lightweight strong alloy chassis with pneumatic tyres, powder coated alloy frame, non marking hoses, powerful recirculation vane pump, super strong neodymium magnetic conditioner, quick open cleanable clear basket strainer unit, high flow spin on filtration unit and a unique turbo cyclone separator. The highest quality components are used in the manufacturing of the FuelTurbo unit. Today’s modern diesels have absolutely no tolerance for old or contaminated fuel. Major oil companies state that diesel fuel in storage has a shelf life of 6 months at ambient temperatures of 30 degrees C or more and 6-12 months at ambient temperatures of 20 degrees C. Diesel fuel kept in service past these periods will become unusable without a regular diesel testing and fuel polishing program in place. Fuel contamination of some type can usually be found in 90 % of diesel fuel tanks and this is the undisputed biggest cause of diesel engine problems. The FuelTurbo restores life back to old fuel, no spillage or hazardous situation can occur during its operation. It’s also a green machine and great for the environment as it reduces the need to discard and replace old or contaminated diesel fuel. The unit removes the contamination from the diesel fuel and also the tank restoring the fuel and tank back to its original clean as new condition. Clean diesel fuel burns more effectively which increases engine power and improves fuel economy. With the use of the FuelTurbo system lower operating mechanical costs can be achieved along with improved equipment reliability. Diesel fuel is the life blood of an engine and without clean pure fuel you will have major reliability issues such as equipment downtime / revenue loss and expensive repairs being required. Serious safety problems may also arise when the engine stops due to blocked filters and expensive component failures like injectors and fuel pumps may eventuate when you use contaminated fuel if the use of diesel fuel testing kits are not included in your regular maintenance program. The regular use of diesel fuel microbial field test kits should also be considered. The FuelTurbo system can be used to clean, recondition, renew and polish contaminated diesel fuel and tank systems in marine vessels, power generators, construction equipment, storage tanks, automotive vehicles, mining equipment and many other equipment situations.